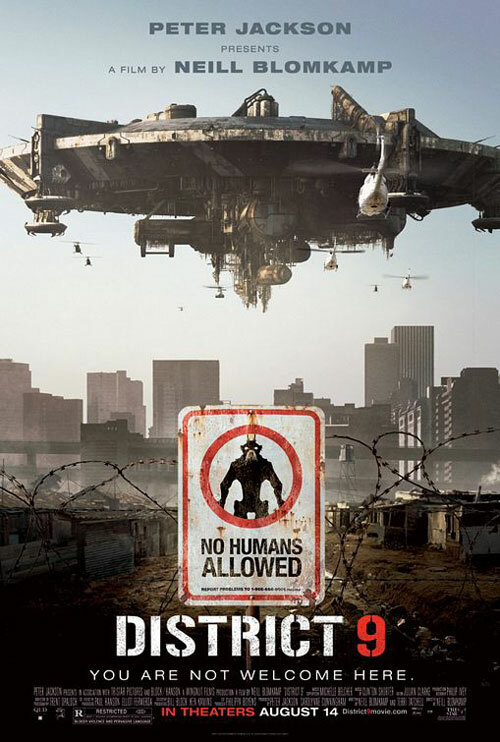 District 9 is a 2009 science fiction thriller film directed by Neill Blomkamp. It was written by Blomkamp and Terri Tatchell; and produced by Peter Jackson. The film stars Sharlto Copley, Jason Cope and David James. Copley plays the role of Wikus Van De Merwe, an Afrikaner bureaucrat assigned to relocate a race of extraterrestrial creatures, derogatorily referred to as "prawns", from District 9, a military-guarded slum in Johannesburg, South Africa, to an internment camp outside the city. The story, adapted from Alive in Joburg, a 2005 short film directed by Blomkamp and produced by Copley, pivots on the themes of xenophobia and social segregation. 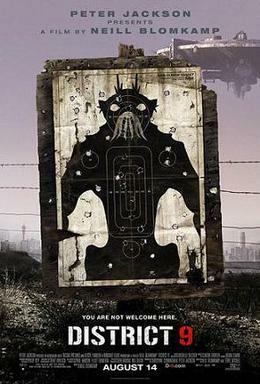 The title and premise of District 9 were inspired by events that took place in District Six, Cape Town during the apartheid era. The film was produced for $30 million and shot on location in Chiawelo, Soweto, presenting fictional interviews, news footage, and video from surveillance cameras in a part-mock documentary style format. The aliens in District 9 were designed by Weta Workshop, and the design was executed by Image Engine. Blomkamp established criteria for the design of the aliens. He wanted the species to be insectile but also bipedal. The director wanted the audience to relate to the aliens and said of the restriction on the creature design, "Unfortunately, they had to be human-esque because our psychology doesn't allow us to really empathize with something unless it has a face and an anthropomorphic shape. Like if you see something that's four-legged, you think it's a dog; that's just how we're wired... If you make a film about an alien force, which is the oppressor or aggressor, and you don't want to empathize with them, you can go to town. So creatively that's what I wanted to do but story-wise, I just couldn't." Blomkamp originally sought to have Weta Digital design the creatures, but the company was busy with effects for Avatar. The director then decided to choose a Vancouver-based effects company because he anticipated to make films there in the future and because British Columbia offered a tax credit. Blomkamp met with Image Engine and considered them "a bit of a gamble" since the company had not pursued a project as large as a feature film. Aside from the aliens appearing on the operating table in the medical lab, all of them were computer generated by CGI Special Effects. Weta Digital designed the mothership and the drop ship, while the exo-suit and the little pets were designed by The Embassy Visual Effects. Zoic Studios performed overflow 2D work. On-set live special effects were created by MXFX. In January 2010, the film was nominated for the Oscars and it will be a contender for the last three places in February 2010. IM NOT PUTTING YOUTUBE CLIPS UP AS ITS SO EASY TO SPOIL THE FILM!